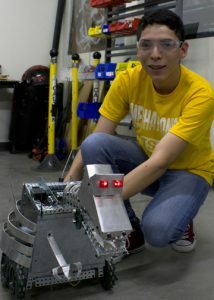 Flavio Tello is a Mechatronics Technology student at Texas State Technical College. The McKinney native and his family moved to Harlingen to be closer to their relatives. Tello maintains a 3.8 grade-point-average and expects to graduate Spring 2019 with his associate degree. After graduation, I am interested in pursuing a Bachelor’s degree at Texas A&M University. I want to specialize in the robotics field. TSTC has helped me prepare for higher education and I am ready to pursue it. In all honesty, I couldn’t tell you what I want to be yet. I can tell you that Robotics is where my interest lies and that I am interested in Toyota as a company, particularly in assembling, processing and manufacturing. They often come to recruit students here so I know a lot about them. I have two accomplishments that I’m proud of. First, getting an A on my math final was one of them, and second is helping my instructor create machines to display at TSTC during our recruitment events. I love showing prospective students what you can accomplish under the right guidance, and it gives me a sense of pride creating something that TSTC is proud to showcase. Name a TSTC person who most influenced your success. My Mechatronics Technology Instructor Eutiquio Calderon and Mechatronics Technology Lab Assistant Alberto Perez have had the most influence. They encourage me to keep doing what I like when I feel like giving up. What is your advice for TSTC students? Focus on your studies, even throughout high school. You will be better prepared for what is ahead and you will have more opportunities. What you do in the beginning of your educational career will affect your grade-point-average in the future. This entry was posted in Harlingen on July 30, 2018 by Amanda Sotelo Sotelo.